Check our Compatibility Guide if you want to know whether Acrolinx for VS Code works with your local platforms. You can use Acrolinx for VS Code to include content quality in your content creation process. What content can I check with Acrolinx for VS Code? Acrolinx for VS Code checks all file types that are supported by your Acrolinx Platform. How can I install, update or uninstall Acrolinx for VS Code? Acrolinx for Visual Studio Code is available as an extension from the Visual Studio Marketplace. You can search for it within VS Code, and install it like any other extension. Open Visual Studio Code and navigate to Extensions from the Activity Bar. Type "Acrolinx" in the search bar. When Acrolinx for Visual Studio Code appears, click Install. Click Reload to activate the extension. Before you can connect to Acrolinx, your Acrolinx administrator needs to set the CORS property to null. Acrolinx for VS Code is ready to use! Once you've installed Acrolinx for VS Code directly from the Marketplace, you can update it like any other extension. By default, VS Code will update your extensions for you. You generally have to reload VS Code to activate an extension update. If you're updating from a version of Acrolinx for VS Code that wasn't on the Marketplace, the process is a little different. Open VS Code and navigate to Extensions from the Activity Bar. Find Acrolinx for Visual Studio Code and click to open the extension. Reload VS Code to deactivate the extension. Restart (close and reopen) VS Code. Follow the regular installation instructions described above. To show the Sidebar, you first need to save a document or open a saved document. Show the Sidebar by clicking in the title area of your document's editor region. The Sidebar will open in the next editor region. You can move the Sidebar around like a regular document in VS Code. To learn more about editor regions, take a look at the VS Code documentation on this feature. You can't use the Sidebar on a document that's in the same editor region. If you try to do this, you'll see an error message saying: "To check and review your content, move the Acrolinx Sidebar to a different editor region." Simply drag and drop the Sidebar to a different editor region to continue using the Sidebar on your document. Where can I change my Acrolinx URL? You can change your Acrolinx URL by signing out and signing in again. Sign out from the slide-out menu in the Sidebar. Acrolinx for VS Code can check a selected section of your content. Select some content by highlighting it with your cursor. See the article on CORS for more details. 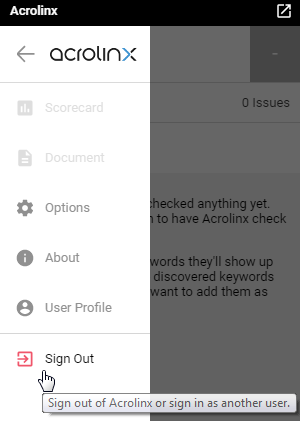 As an administrator, you can preset the Acrolinx URL that your writers use to connect to Acrolinx. Writers can always manually change their Acrolinx URL by signing out of the Sidebar and signing in again. How you preset the Acrolinx URL depends on whether a computer has Acrolinx Storage or not. Open the acrolinxStorage.json JSON file in your Acrolinx Storage folder. If a computer doesn't already have Acrolinx Storage, you can set the Acrolinx URL before installation using the VS Code user setting acrolinx.serverAddress. VS Code stores its user settings as a .json file. The VS Code documentation has more detailed information about these files. If you want every user to use the same settings, you can create the user setting file once and copy it to all other computers. Note: When Acrolinx for VS Code initializes for the first time, it creates the acrolinxStorage.json file in Acrolinx Storage. This file overrides the user setting acrolinx.serverAddress, making it obsolete.